Theodore Muller, artist; New York et Brooklyn: Vue Prise au dessus de la batterie; c. 1850. In the mid-19th century, cartographers and illustrators had neither helicopters nor satellites to assist them in their map-making endeavors. Instead, panorama painters had to supplement their knowledge of local geography with maps, up-to-date building directories, and a healthy imagination to accurately inform their impossibly lofty portrayals of the city. 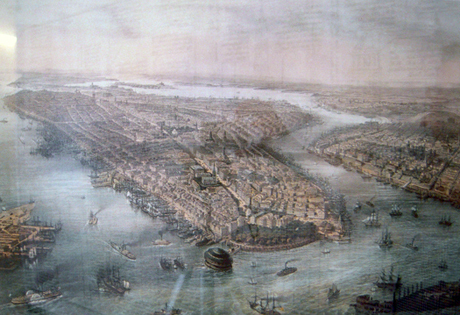 This is a view of Manhattan's southern tip, looking north, published around 1850. An exceptional example of three stone lithography and hand-colored, it depicts parts of New Jersey and Brooklyn on the left and right sides respectively. Also notice the somewhat exaggerated detail of the buildings on Wall Street. This suggests the artist's (and emphasizes the general public's) high regard for Wall Street as an historical and economic beacon of the city. Broadway is depicted as the city's most prominent street, bisecting the island. Trinity Church is located there at where Wall Street meets Broadway. The Merchant's Exchange dome is on the south eastern side and the Custom House's (soon to be taken over by the Sub-Treasury in 1862) colonnade is on the north side of the street facing south situated between the two aforementioned buildings. One begins to gain an understanding of how important and busy Broadway was from a very early point in history. Manhattan appears to be an elevated plane carved in two by the street. This map does an excellent job of depicting urban density at a uniform scale of height before the island was inundated by tall buildings.